The Haas Institute for a Fair and Inclusive Society’s Equity Metrics and California Community Partnerships programs jointly engage in Fair Housing research and advocacy, which broadly seeks to promote access to opportunity for people of color and other groups which historically had limited access to housing in amenity-rich neighborhoods. Our Fair Housing work involves both identifying “neighborhoods of opportunity” using spatial analyses, and providing supporting research for governmental agencies in their duty to “affirmatively further fair housing,” as required by the 1968 Fair Housing Act. This work has manifested in various ongoing and completed projects. Amicus curae brief for the 2013 Supreme Court case Texas Department of Housing and Communities Affairs v. Inclusive Communities Project, Inc., which documented how government incentives reinforced racial segregation. These varied research projects are broadly categorized as Fair Housing work in reference to the 1968 Fair Housing Act. This measure not only outlawed private discrimination in housing, but additionally required that governmental entities have a duty to “affirmatively further fair housing,” or in other words, take active measures to counteract historical discrimination and promote access to housing opportunity for communities of color and other marginalized groups, such as people with disabilities and people born outside of the U.S. The above chart, featured in our August 2017 “Unfair Shares” Report, shows how the goals for housing production in the Bay Area for the years 2015-2023 (y-axis) were correlated with the demographic breakdown (x-axis). Each dot represents a Bay Area city. Until the last few years, local governments were not rigorously monitored or evaluated on their efforts to overcome historical barriers to housing opportunity for historically disadvantaged populations. In the wake of recent regulatory clarification on the meaning of “affirmatively furthering fair housing” (or AFFH), the Haas Institute for a Fair and Inclusive Society has conducted research to support local governments and the state of California in their duty to AFFH. Some of our projects have elucidated the racial dimensions of their planning and policymaking decisions where these were previously underestimated or not fully understood. Additionally, we have utilized the Haas Institute’s Opportunity Mapping framework to understand where “areas of opportunity” are located so that measures can be taken to improve access to these places for historically disadvantaged communities. 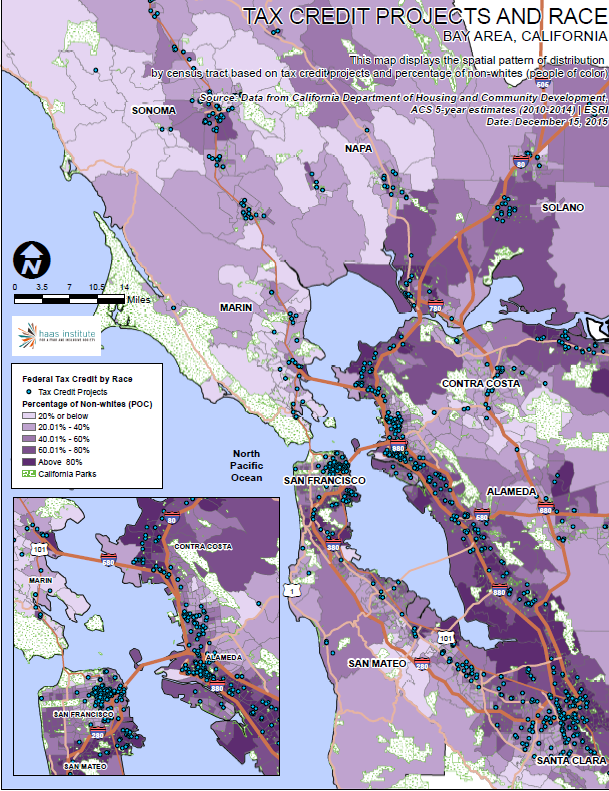 Map from the March 2017 report on Low-Income Housing Tax Credit projects in the San Francisco Bay Area. This image shows that these housing projects have overwhelmingly been built in the most segregated neighborhoods in the Bay Area.